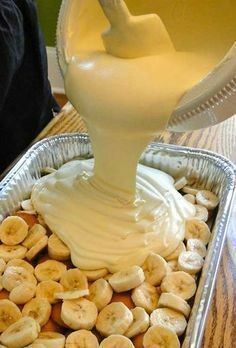 Recipe for The Best Banana Pudding Ever – This recipe makes the best banana pudding I have ever tasted. And I’ll bet it’s the best banana pudding you’ve ever tasted, too. Line the bottom of a 13×9 inch inch dish with 1 bag of cookies and layer bananas on top. In a bowl, combine the milk and pudding mix and blend well using a handheld electric mixer. Using another bowl, combine the cream cheese and condensed milk together and mix until smooth. Fold the whipped topping into the cream cheese mixture. Add the cream cheese mixture to the pudding mixture and stir until well blended. Pour the mixture over the cookies and bananas and cover with the remaining cookies. Refrigerate until ready to serve! 0 Response to "The Best Banana Pudding Ever"